Have your soup & eat your veggies, too!! OK, confession time: I can’t eat just plain soup. I’m discovering that I’m a texture girl, so I’m constantly crushing up tortilla chips, adding avocado, grabbing a piece of toasty bread and dunking it into my favorite, warm bowl. Another thing, tomato soup is besties with grilled cheese. Like, BFF4L. 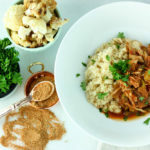 Anyway, I promised you slow cooker recipes and here’s another! 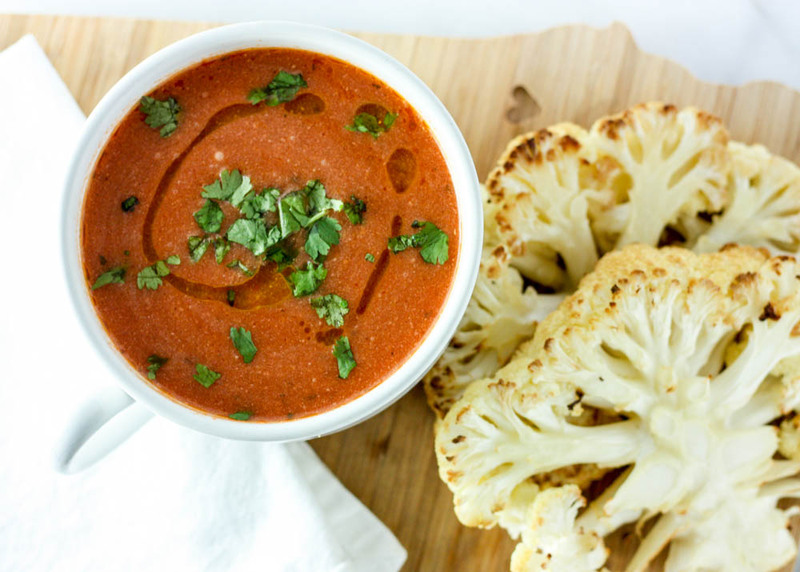 The tomato soup will cook and deepen in flavor over time and you’ll have the freedom to quickly roast your cauliflower to perfection. 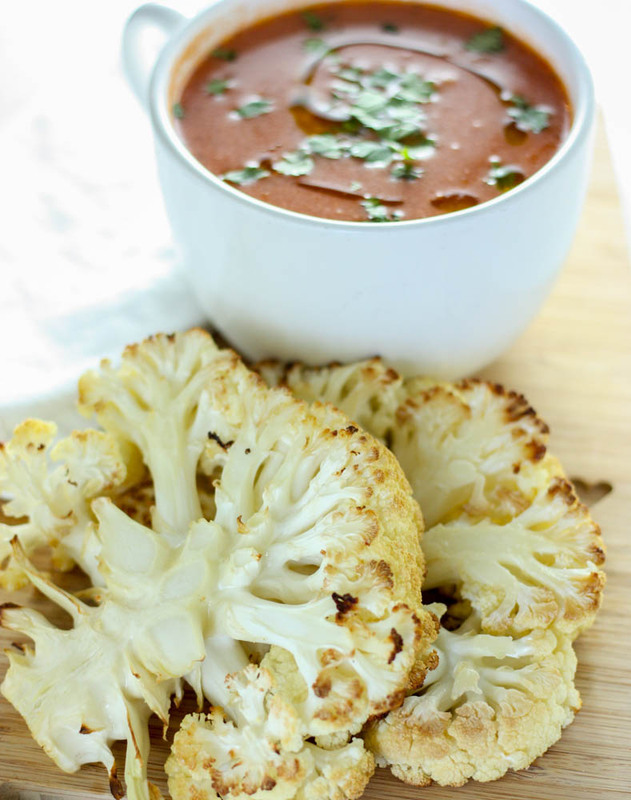 Have you had roasted cauliflower?! If not – get ready for a treat. I am a total meat eater, but I have a true appreciation for properly prepared and flavorful veggies. 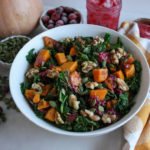 This recipe is vegetarian and vegan, too if you use vegetable stock! Let’s chat about this cauliflower steak. 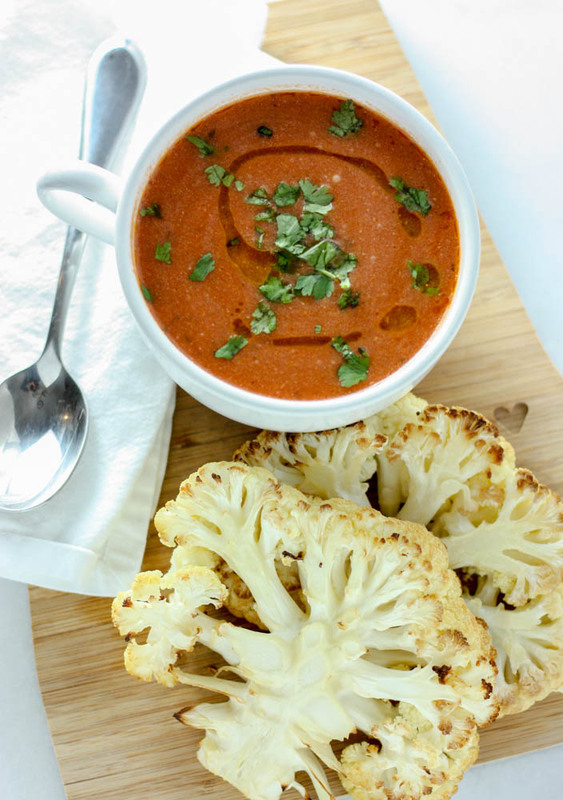 Instead of chopping up a bunch of bite sized pieces and roasting them, we’ll cut large hunks or “steaks” of cauli (like the picture below shows) and roast them as a large piece. 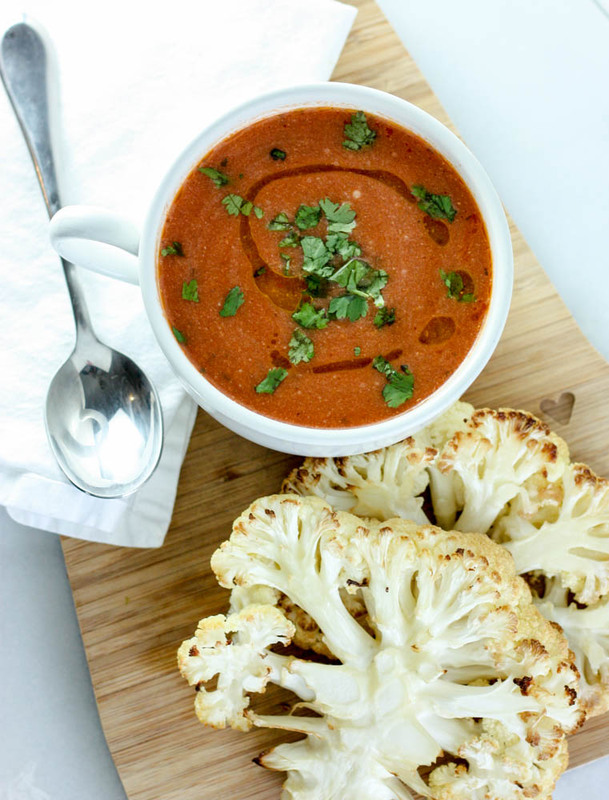 When you eat your soup, you can dunk, dip and devour the slightly crisp and garlicky cauliflower into the tomato soup and feel the satisfaction of a meal match made in heaven. See, this is what your “steak” will look like! Add the crushed tomatoes, stock, garlic powder, basil, salt, pepper and oregano to your slow cooker. Turn this to high and let it cook for 4 hours. When 4 hours passes, ladle your tomato mixture into a food processor or blender. Blend until smooth. You may need to do this in batches so you don’t get tomato everywhere. If you have an immersion blender, feel free to use that directly in the slow cooker to process the mixture until smooth. Pour the tomato mixture back into the slow cooker and turn it to low. Add in the coconut milk, stir and let cook for another hour on low. 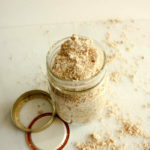 While the coconut milk incorporates, preheat your oven to 400 degrees. Take out your cauliflower and cut in half. Cut in half again, creating 4 steaks. If some of the ends break off, it’s OK, they’ll still roast up wonderfully. Place them on a baking sheet lined with parchment and spray with olive or avocado oil, sprinkle with salt and garlic powder, and pop into the oven. Roast for about 30 minutes, flipping half way. Remove when the edges start to brown and crisp. Give your soup a good stir and pour into a big bowl. 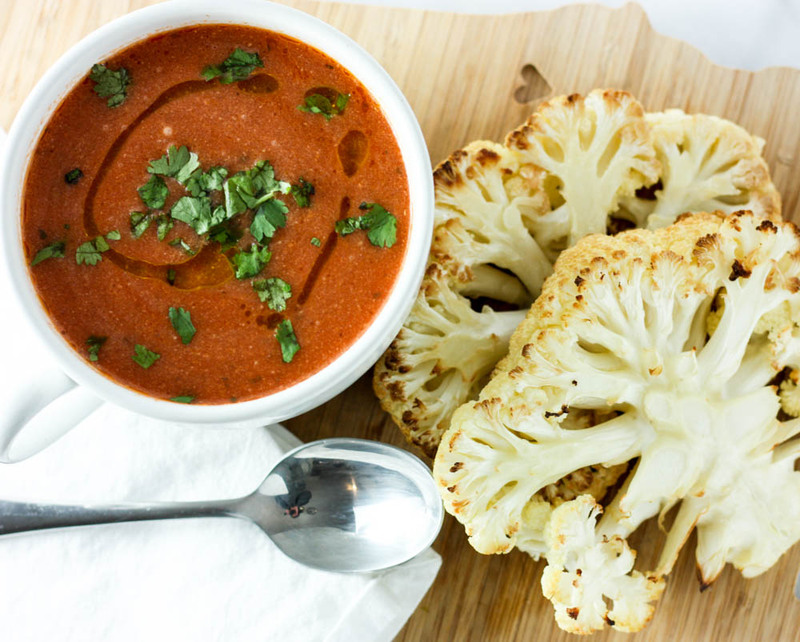 Serve with a decadent piece of the cauliflower steak. Add the crushed tomatoes, stock, 1 tsp of garlic powder, basil, 2 tsp of salt, pepper, and oregano to your slow cooker. Turn this to high and let it cook for 4 hours. When 4 hours passes, ladle your tomato mixture into a food processor or blender. Blend until smooth. You may need to do this in batches so you don’t get tomato everywhere. If you have an immersion blender, feel free to use that directly in the slow cooker to process the mixture until smooth. Pour the tomato mixture back into the slow cooker and turn it to low. Add in the coconut milk, stir and let cook for another hour on low. While the coconut milk incorporates, preheat your oven to 400 degrees. Take out your cauliflower and cut in half. Cut in half again, creating 4 steaks. If some of the ends break off, it’s OK, they’ll still roast up wonderfully. Place them on a baking sheet lined with parchment and spray with olive or avocado oil, sprinkle with 1/2 tsp of salt and 1/2 tsp of garlic powder, and pop into the oven. Roast for about 30 minutes, flipping half way. Remove when the edges start to brown and crisp. O I love cauliflower steaks! Besides eating cauli raw, steaks is my next favorite way! I’ve been a skeptic of the cauliflower steaks but you may have converted me! Need to try these asap! 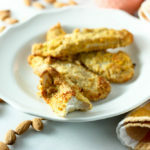 Wow I would have never thought of making cauliflower steaks, but these look really good! 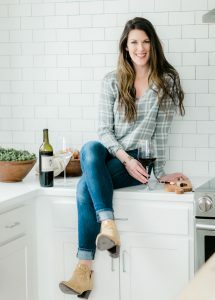 Girl you are killing it with these Whole30 recipes. Seriously so creative and delicious!! I’m trying your pork carnitas this week, but this one will be next on my menu. 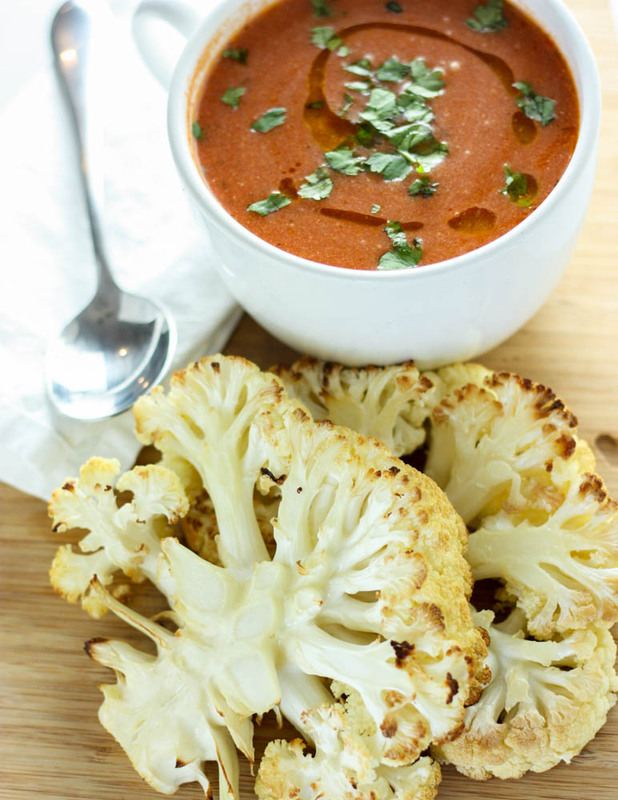 I love the idea of dunking cauli in the soup- sounds delish! !